Visit New Orleans like a real local and learn where all the locals' secret sweet spots are with this insider tour. Learn about New Orleans' history along with detailed stories of events that made New Orleans become the city that it is today. During this tour you are encouraged to eat, drink and most of all have fun! Enjoy a tour where learning is intoxicating. Meet your guide in the French Quarter to begin your insider look at New Orleans. Nicknamed the 'Big Easy,' New Orleans is known for its round-the-clock nightlife, vibrant live-music scene and spicy, singular cuisine reflecting its history as a melting pot of French, African and American cultures. Embodying its festive spirit is Mardi Gras, the late-winter carnival famed for raucous costumed parades and public partying. During this tour, you'll be led around the city to find out where locals hang out. Explore the French Quarter and Frenchman Street. Take a stroll down Royal Street and see the famous art galleries. See where the French Opera house once stood on Bourbon Street. Learn about Voodoo that is still practiced in New Orleans. Did you know Marie Laveau, the Voodoo Queen, was allowed to practice Voodoo in the Catholic Church? Learn some interesting facts about New Orleans' very famous celebration, Mardi Gras. 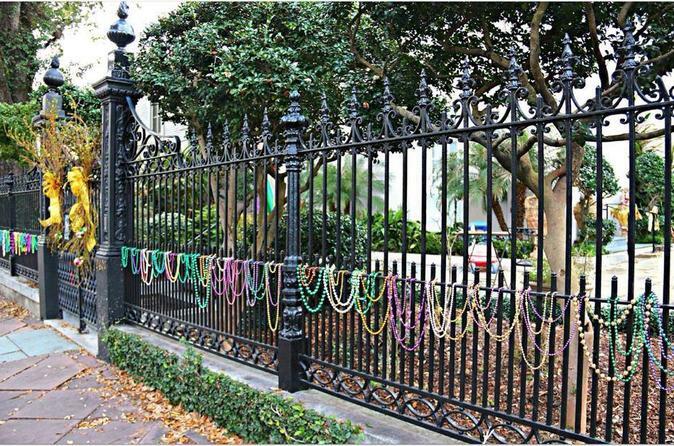 Visit locations where Mardi Gras traditions still take place every year and learn the history behind these traditions. Visit the old U.S. Mint, the very popular French Market (which is a beautiful open air market), and The Louisiana State Museum (called the Cabildo) where the Louisiana Purchase was signed in 1803. Visit the oldest (still operational) church in the United States and visit the oldest home in the Mississippi Valley, built in a West Indies style of architecture. Learn about shot gun homes, creole cottages, and the difference between balconies and galleries. Experience the beauty of the mighty Mississippi River. See the home of Brad Pitt and where other Hollywood stars decided to call the French Quarter home. Visit locations where scenes from movies have been filmed right in the French Quarter. Learn what nuns, pirates, prostitutes and convicted felons all have in common with with the founding of New Orleans. Visit over 14 different locations during this tour. This tour is packed full of detailed information pertaining to The Big Easy, then and now.